For the first time, Heidelberg University Library has been ranked first in the renowned BIX Library Index, which compares the current performance of the major academic libraries in Germany. The ranking reflects the quality of university libraries with respect to offerings, usage, efficiency and development potential. Over 2.3 million visitors per year, a continuous increase in circulation by 25 percent over and against 2005 and millions of accesses to the licensed online resources are eloquent proof of the excellence of Heidelberg University Library. With the rapid digitisation of its precious historical holdings, Heidelberg University Library plays a pioneering role in the library world. As Dr. Probst said, the presentation of this digitised material and the standards of access to text and picture material “have been acclaimed both nationally and internationally”. For its special subject collections funded by the German Research Foundation –– Egyptology, European art history, classical archaeology, South Asia – Heidelberg University Library operates three virtual specialist libraries. In Dr. Probst’s view, another success factor is the restructuring of the library system. The 68 departmental libraries have been organised into administrative units and operate using standardised workflows. 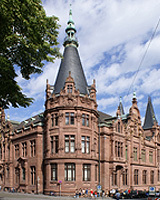 “The University Library assures an excellent supply of literature for research and teaching at Heidelberg University. At the same time, it is a central learning location at Ruperto Carola,” Dr. Probst emphasises. “That is why the plans to extend the library premises are so important.” Preparations began in September 2009, and the construction work itself will be completed a section at a time. The main purpose is to provide a greater number of reading places. “This is the only way that we can satisfy the growing demand for attractive, modern workstations at the University’s central location in the Old Town,” says Dr. Probst. This year, a total of 93 academic libraries, including 51 university libraries divided into two size categories, supplied data for the BIX Library Index. Rankings and scores were awarded for four different criteria. The 17 individual indicators provide a detailed picture of the participating libraries. The ranking is supported by the Bertelsmann Foundation. To view the results, go to www.bix-bibliotheksindex.de. Digital picture material is available from the Press Office.